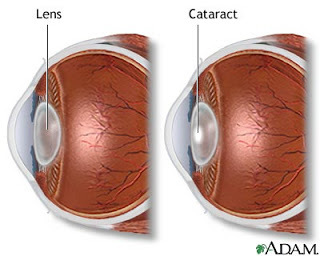 A cataract is an opacity of the lens that distorts image projected onto the retina and that can progress to blindness. The lens opacity reduces visual acuity. As the eye ages, the lens loses water and increases in size and density, causing compression of lens fibers. A cataract then forms as oxygen uptake is reduced, water content decreases, calcium content increases, and soluble protein becomes insoluble. Intervention is indicated when visual acuity has been reduced to a level that the client finds to be unacceptable or adversely affects lifestyle. Over time, compression of lens fibers causes a painless, progressive loss of transparency that is often bilateral. The rate of cataract formation in each eye is seldom identical. Cataracts have several causes and may be age-related, present at birth, or formed as a result of trauma or exposure to a toxic substance. The most common cataract is age-related (senile cataract). Traumatic cataracts develop after a foreign body injures the lens. 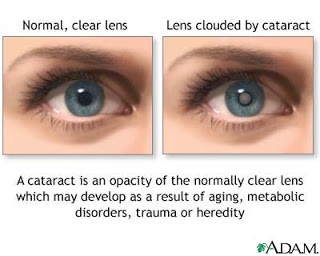 Complicated cataracts develop as secondary effects in patients with metabolic disorders (e.g., diabetes mellitus), radiation damage (x-ray or sunlight), or eye inflammation or disease (e.g., glaucoma, retinitis pigmentosa, detached retina, recurrent uveitis). Toxic cataracts result from drug or chemical toxicity. Congenital cataracts are caused by maternal infection (e.g., German measles, mumps, hepatitis) during the first trimester of pregnancy. General Comments: No specific laboratory tests identify cataracts. Diagnosis is made by history, visual acuity test, and direct ophthalmoscopic exam. There is no medical treatment for cataracts, although use of vitamin C and E and beta-carotene is being investigated. Glasses or contact, bifocal, or magnifying lenses may improve vision. Mydriatics can be used short term, but glare is increased. Surgical removal of the opacified lens is the only cure for cataracts. 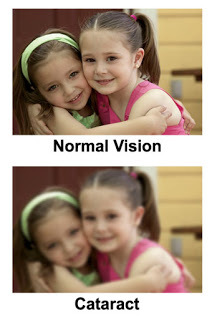 The lens can be removed when the visual deficit is 20/40. 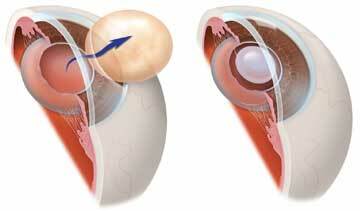 If cataracts occur bilaterally, the more advanced cataract is removed first. Extracapsular cataract extraction, the most common procedure, removes the anterior lens capsule and cortex, leaving the posterior capsule intact. A posterior chamber intraocular lens is implanted where the patient’s own lens used to be. Intracapsular cataract extraction removes the entire lens within the intact capsule. An intraocular lens is implanted in either the anterior or the posterior chamber, or the visual deficit is corrected with contact lenses or cataract glasses. Complications may include retinal disorders, pupillary block, adhesions, acute glaucoma, macular edema, and retinal detachment. Following extracapsular cataract extraction, the posterior capsule may become opacified. This condition, called a secondary membrane or after-cataract, occurs when subcapsular lens epithelial cells regenerate lens fibers, which obstruct vision. After-cataract is treated by yttrium-aluminum-garnet (YAG) laser treatment to the affected tissue. Acetazolamide a carbonic anhydrase inhibitor is used to reduce intraocular pressure by inhibiting times a day inhibitor formation of hydrogen and bicarbonate ions. Phenylephrine a Sympathomimetic agent causes abnormal dilation of the pupil constriction of conjunctival arteries. Other Medications: Postoperatively, medications are prescribed to reduce infection (gentamicin or neomycin) and to reduce inflammation (dexamethasone), taking the form of eye drops. Acetaminophen is prescribed for mild discomfort; tropicamide is prescribed to induce ciliary paralysis. If nursing care is provided in the patient’s home, structure the environment with conducive lighting and reduce fall hazards. Suggest magnifying glasses and large-print books. Explain that sunglasses and soft lighting can reduce glare. Assist the patient with the actions of daily living as needed to remedy any self-care deficit. Encourage the patient to verbalize or keep a log on his or her fears and anxiety about visual loss or impending surgery. Help plan events to solve the problems with social isolation. Be sure the patient understands all medications, including dosage, route, action, adverse effects, and need for postoperative evaluation, usually the next day, by the eye surgeon. Review installation technique of eye drops into the conjunctival sac. Teach the patient to avoid over-the-counter medications, particularly those with aspirin. Instruct the patient to report any bleeding, yellow-green drainage, pain, visual losses, nausea, vomiting, tearing, photophobia, or seeing bright flashes of light. Instruct the patient to avoid activities that increase intraocular pressure such as bending at the waist, sleeping on the operativeside, straining with bowel movements, lifting more than 15 pounds, sneezing, coughing, or vomiting. Instruct the patient to wear a shield over the operative eye at night to prevent accidental injury to the eye during sleep and to wear glasses during the day to prevent accidental injury to the eye while awake. Recommend that the patient avoid reading for some time after surgery to reduce eye strain and unnecessary movement so that maximal healing occurs. Advise the patient not to shampoo for several days after surgery. The face should be held away from the shower head with the head tilted back so that water spray and soap avoid contact with the eye. Vacuuming should be avoided because of the forward flexion and rapid, jerky movement required. Clients fitted with cataract eyeglasses need information about altered spatial perception. The eyeglasses should be first used when the patient is seated, until the patient adjusts to the distortion. Instruct the client to look through the center of the corrective lenses and to turn the head, rather than only the eyes, when looking to the side. Clear vision is possible only through the center of the lens. Hand-eye coordination movements must be practiced with assistance and relearned because of the altered spatial perceptions. Activity / Rest: The change from the usual activities / hobbies in connection with visual impairment. Neurosensory: Impaired vision blurred / not clear, bright light causes glare with a gradual loss of peripheral vision, difficulty focusing work with closely or feel the dark room. Vision cloudy / blurry, looking halo / rainbow around the beam, changes eyeglasses, medication does not improve vision, photophobia (acute glaucoma). Pain / Leisure: Discomfort light / watery eyes. Sudden pain / heavy persist or pressure on or around the eyes, headaches. Anxiety related to lack of knowledge. Lowering the emotional stress, fear and depression. Acceptance and understanding instructions surgery. Assess the degree and duration of visual impairment. Encourage conversation to find out the patient’s concerns, feelings, and the level of understanding. Rationale: Information can eliminate the fear of the unknown. Coping mechanisms can help patients with kegusara compromise, fear, depression, tension, despair, anger, and rejection. Orient the patient to the new environment. Rationale: The introduction to the environment helps reduce anxiety and increase security. Rationale: Patients who have a lot of information easier to receive treatment and follow instructions. Describes intervention much detail as possible. Rationale: Patients who experience visual disturbances rely on other senses salts input information. Push to perform daily living habits when able. Rationale: Self-care and will increase the sense of healthy independence. Encourage participation of family or the people who matter in patient care. Rationale: Patients may not be able to perform all duties in connection with the handling of personal care. Encourage participation in social activities and diversion whenever possible (visitors, radio, audio recording, TV, crafts, games). Rationale: Social isolation and leisure time is too long can cause negative feelings. Help the patient when able to do until postoperative ambulation and achieve stable vision and adequate coping skills, using techniques of vision guidance. Rationale: Reduce the risk of falling or injury when the step stagger or have no coping skills for vision impairment. Help the patient set the environment. Rationale: Providing facilities of independence and lower the risk of injury. Orient the patient in the room. Rationale: Improving safety and mobility in the environment. Rationale: shield or goggles protect the eyes against injury. Do not put pressure on the affected eye trauma. Rationale: The pressure in the eye may cause further serious damage. Use proper procedures when providing eye drugs. Rationale: Injury can occur if the container touch the eye medication. Reduction of pain and the IOP. Give medications to control pain and the IOP as prescribed. Rationale: Use the recipe will reduce pain and the IOP and increase comfort. Give cold compress on demand for blunt trauma. Rationale: reduce the edema will reduce the pain. Rationale: The level of lighting is more lower after surgery. Encourage use of sunglasses in strong light. Rationale: Strong light causes discomfort after use of eye drops dilator. Complications can be avoided or promptly reported to the doctor. Maintain strict aseptic technique, do wash your hands frequently. Rationale: It would minimize infection. Supervise and report immediately any signs and symptoms of complications, such as: bleeding, increased IOP or infection. Rationale: The discovery of early complications can reduce the risk of permanent vision loss. Rationale: Elevation of the head and avoid lying on the side of the operation may reduce the edema. Instruct the patient to know bedrest activity restrictions, with flexibility to the bathroom, according to a gradual increase in activity tolerance. Rationale: Limitation of activity prescribed to speed healing and avoid further damage to the injured eye. Describe the actions that should be avoided, as prescribed by coughing, sneezing, vomiting (ask for medication for it). Rationale: It can lead to complications such as vitreous prolapse or dehiscence injury due to increased tension on the suture wounds that are very subtle. Give medications as prescribed, according to prescribed techniques. Rationale: Drugs are administered in a way that is inconsistent with prescriptions can interfere with healing or cause complications.